Tas Walker (22(1):6) reports how belemnite fossils were reckoned concretions when thought by specialists to occur in the ‘wrong aged’ strata, only to be recognized as genuine fossils when revised locality information was compatible with evolutionistic beliefs about the ‘correct’ age of the strata. This is far from an isolated instance. In my book, Studies in Flood Geology (2nd Edn, 1999), p. 186, I record multiple such instances. For over a century, Paleozoic occurrences of belemnites were admittedly ignored or discounted because of a long-held preconception that belemnites did not originate until the Triassic. Isn’t it ironic that we spend billions of dollars pointing radio telescopes all over space in the hopes of finding an intelligent signal, but we cannot even receive our own signal from a probe on Mars? John Eggleston’s suggestion (21(4):5) that Noah’s Ark may no longer exist is not supported by historians. The Jew, Josephus, writing in the first century stated ‘for the ark being saved in that place, its remains are shown there by the inhabitants to this day’. He also quoted Berossus, a Chaldean priest in the third century bc, who wrote that ‘there is still some part of this ship in Armenia at the mountain of the Cordyaens; and that some people carry off pieces of the bitumen, which they take away, and use chiefly as amulets for the averting of mischiefs’. There is no evidence that the Ark was dismantled when it had served its purpose. Moreover there have been numerous reported sightings of the Ark in the last 100 years. I was delighted to ‘c the difference’ in the short article about the speed of light. I was thinking some time ago about how the age of stars is determined, with the speed of light, and it occurred to me that it hasn’t always been the same as it is now. It makes sense that light, as everything else in the universe, was contaminated when sin came. Keep up the great work you’re doing — I know it is making a tremendous difference in many lives. 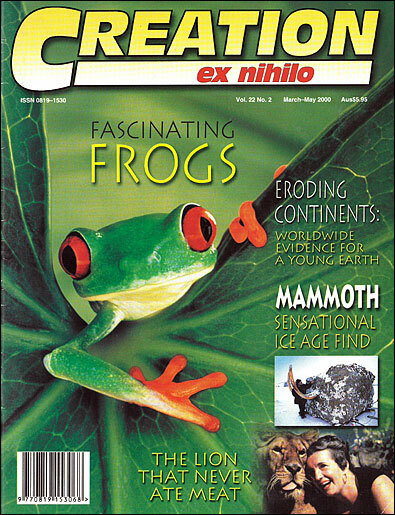 The notion that c has slowed down became popular among creationists when it was shown that historical observations may suggest this (see Creation 12(3):40–41, 1990). However, many creation scientists have become cautious about supporting this in view of some unresolved theoretical difficulties. For the present, the cosmology outlined in Dr Russell Humphreys’ book Starlight and Time is the front-runner among explanations for the issue of distant starlight in a young universe. N.B. a decline in the value of c would not necessarily mean a decay process linked to the Fall. Re: the chicken-eating sheep (21(4):9). A few years ago some vacationing friends spent the day at my home. They left some pork baloney in my refrigerator which went bad so I threw it out to my cats. To my horrified amazement, our two ewes quickly ate the spoiled pork! A few days ago I related my story and the one in your magazine to a friend. This came as no surprise to him. He said he knew of a friend’s horse that would chase down chickens and eat them whole, tearing them apart using his feet and teeth! Does this mean that, as all animals were meant to eat vegetation originally, they can all turn carnivorous as well? See also ‘The lion that wouldn't eat meat’ article this issue — Ed. The most responses to last issue concerned the guest editorial on the evolutionary basis of the Holocaust, followed by the article about dealing with those who insist on ‘leaving the Bible out of’ the origins debate.